The Bat Boy has flown out of the cave and onto the UCLA stage! 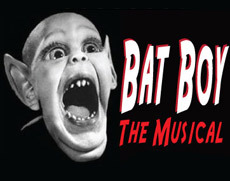 Based on the sensational story from the Weekly World News, this satirical musical about a half-bat/half-boy examines hypocrisy, racism and revenge all to the tune of a catchy score. Featuring undergraduate actors from the Department of Theater. A Ray Bolger Musical Theater Production. May 7-9, 12-16, 2015 at 8 p.m.
May 9 and 16, 2015 at 2 p.m.